To simplify the process of selecting your very own hydroponics kit, we’ve come up with our reviews of the best hydroponics system kits on the market this year. If you want a more hands on approach for deciding, see our buying guide below. 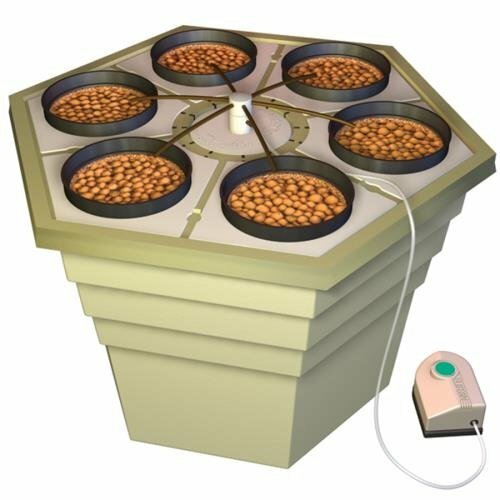 The AeroFlo 30 Hydroponics System – GH8008 is a massive hydroponics kit that can accommodate more than 18, three-inch grow cups. Best for intermediate to advanced growers who wish to grow lots of plants and can handle a larger capacity nutrient basin. 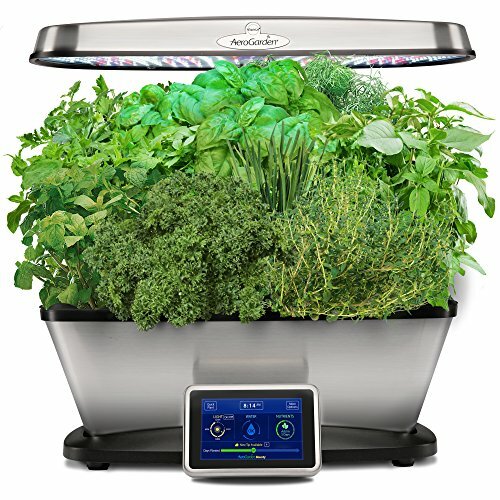 The AeroFlo 30 Hydroponics System utilizes a basic flood and drain system. The six-foot grow beds (three of them) sit on top of a high-capacity nutrient tank that can handle up to 20 gallons of nutrient solution. A support structure holds up the grow chambers in a level manner because the system relies on the natural downward flow to be able to drain the grow cups. There is no sump tank or sump pump. The Bluestone pump is inside the 20-gallon tank and delivers water straight to the grow chambers at set intervals. 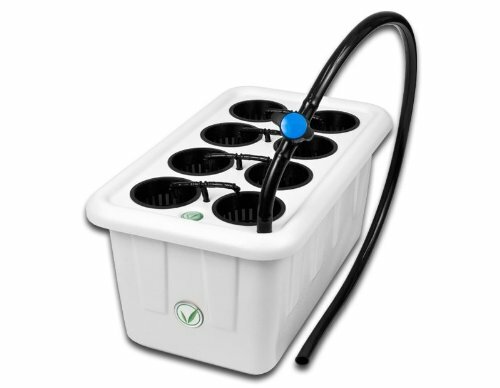 The grow cups used in the AeroFlo 30 are Cocotek, with Hydroton media inside. This system, developed by Xtreme Hydro, is plausible because it’s designed simply and therefore, there are only a few components to watch for breakage. In contrast with more complicated systems, there is but one motor to monitor and there is less piping involved so it will not be that difficult to maintain. The media used is also of good quality and the Cocotek cups means the cups themselves are organic and can absorb the nutrient solution efficiently, helping the plants grow more quickly. The General Hydroponics EcoGrower Drip Hydroponic System is a compact, barrel form-factor hydroponics kits that was designed to grow heavy and large plants. 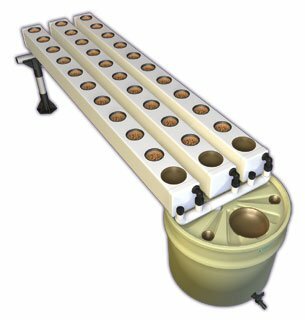 Unlike other run-the-mill hydroponics kits, the General Hydroponics EcoGrower Drip Hydroponic System doesn’t have long growth chambers with short depths. Instead, the growth chamber sits on top of the large barrel-like casing and is supported by the entire, one-piece assembly. The growth pots have lid inserts, and each cup has a depth of six inches or half a foot. Indeed, there’s enough space there for large plants. If you’re planning to cultivate smaller plants or low-lying plants and herbs, this isn’t the correct kit for you as there’s simply too much space available on each growth pot. Reminiscent of the compact Barrelponics system minus the overhead nutrient solution reservoir, the General Hydroponics EcoGrower Drip Hydroponic System runs on an Elite 800 air pump, coupled with ¼ inch air line. The manufacturers use CocoTek lined growth cups for maximum water absorption (plus the material is extremely environmentally friendly but does not tear apart even after transplantation). Clay pebbles are used as the main growth media. The probable reason or the media choice is that clay pebbles can support more weight so when the plants grow, the plant will be able to anchor itself efficiently. The manufacturer, General Hydroponics, has included Flora nutrients to help the grower establish his first hydroponics project. The DreamJoy Hydroponic Grow Kit was designed to sit on the balcony or garden and is a space-saving hydroponics kit because of its square, elevated design. The DreamJoy Hydroponic Grow Kit uses the NFT technique and includes a total of eight pipes for the nutrient solution to flow through. Each pipe has a total of nine growth site for the grow cups of your choice. The big difference between this kit and other kits we’ve previously discussed is it doesn’t have its own nutrient basin. The nutrient basin or reservoir is where the nutrient solution sits before being pumped and is also the end-point of excess water draining from the grow beds. You can plant a total of seventy-two plants on this setup. The growth cups aren’t included, but you can purchase those easily. Actually, this is an advantage as you would be able to shop around for the growth cup that suits your budget and needs. The package includes the eight food-grade PVC pipe assembly, the stand, 110-volt water pump and planting sponges. The package also comes with a 5.25-foot hose that you can use to connect the PVC setup to the 100-volt water pump. After purchasing a nutrient basin, place the basin below the square frame assembly, submerge the water pump and connect it to the PVC setup and you’re set to go! PowerGrow System’s DWC Hydroponic Bubbler 8 Bucket Kit offers a radically different approach to growing plants hydroponically. 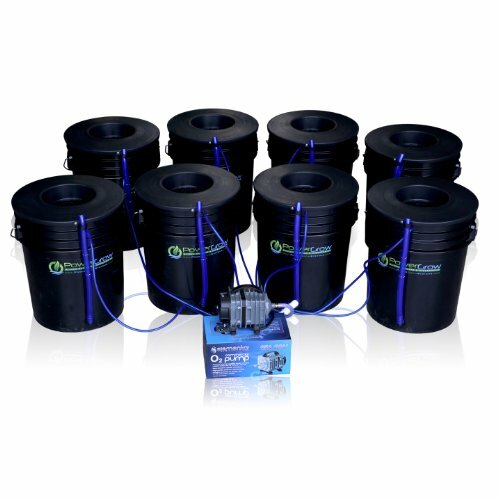 What’s interesting about the DWC Hydroponic Bubble 8 Bucket Kit is that it does away with the conventional growth chamber setup and instead, uses a total of eight thick plastic buckets to support a total of eight plants. What is the rationale behind this design? Instead of using a recirculating system that requires a central reservoir for the nutrient solution, the plants would be submerged in nutrient solution in each bucket. Instead of a water pump driving water through canals or a single grow bed, an air pump is used instead to move the water and oxygenate the roots of the plants. The system comes with an airstone, which is a plus over other similar systems that don’t use airstones to add dissolved oxygen to the water. The complete package includes one large industrial air pump, eight air stones, six-inch basket lids for the grow cups, eight five-gallon buckets, and an unbeatable one year warranty. If you’re worried about not being able to monitor the buckets regularly, don’t – the buckets have been designed to indicate water level inside and each one has a drain so that water changes will be a breeze. Water changes are necessary at some points if salts begin to change the water pH level too drastically. This is normal for hydroponics systems. Superponics-8 Hydroponic Plant Propagation Reservoir System is another radical deviation from the usual raft or NFT system used in hydroponics. Instead of separating the nutrient reservoir and the growth bed, the growth bed is situated on top of the reservoir and a mechanized drip system delivers the water to the grow cups. Excess water is drained back to the reservoir and the process repeats itself indefinitely. According to the manufacturer, Superponics-8 is the fusion of deep water culture and hydroponic technology. It combines the best of both worlds to speed up the growth and maturation of plants without having to resort to larger and more space consuming setups where the nutrient reservoir is separate from the growth beds and lots of piping connect the two main components. Sold with an unbeatable three-year warranty, Superponics-8 also has a long drain tube so you won’t have to worry about having to disassemble the whole thing before being able to carry out a water change. The complete package comes with one 132 GPH water pump, one separate air pump, two medium-sized, barrel-type air stones to introduce dissolved oxygen into the water and a massive reservoir where the top support is located. The top support is home to a total of eight lid covers, each interconnected by smaller piping to ensure proper flow and water distribution throughout the system. Among the hydroponics kits we’ve reviewed so far, the Aerogarden Bounty Elite is probably the cutest and most compact of them all. Apart from its highly compact and inclusive design, the Aerogarden Bounty Elite Gourmet Herb Seed Pod Kit was designed as a smart countertop gardening companion. The kit runs on the best principles of hydroponics, but at the same time, it wasn’t meant to be placed in the garage or in the basement. It was designed to complement other kitchen appliances and sit daintily on top of the counter like those other appliances, too! The kit can be used to grow up to nine adult plants at a time. The kit comes with a low-wattage 45-watt LED grow light that was adjusted to provide just the right spectrum of light energy for the growing plants to maximize photosynthesis. If you’ve noticed, this particular system uses far less energy than its larger counterparts. And that’s alright! Because the light is positioned just above the growing plants and you only have nine low-lying plants growing side by side, you don’t need HID lighting and high-wattage LED grow lights to make them grow. Just a little light will go a long way already. Included in the package are seeds of Genovese basil, thai basil, curly parsley, Italian parsley, thyme, chives, dill, mint, and 3 ounces of patented plant nutrients that is sufficient for one whole season. This kit is fully automated and offers a touchscreen control panel and viewing pane that helps you monitor water level, pH level and other important variables in the hydroponics system. If you’re worried about the kit being too ‘high tech’ or complicated, don’t! The system will actually guide you from start to finish during setup, through a simple prompts system. The system will also switch the lights on and off to optimize the day and night cycle. A hydroponics system kit is essentially a ready-made system (a turn-key system) that includes all of the essential components of a working hydroponics system. The main benefit of using a kit is you no longer have to purchase the individual components separately. All you need to do is buy a kit, read the manual and install the parts and you’re set to go. 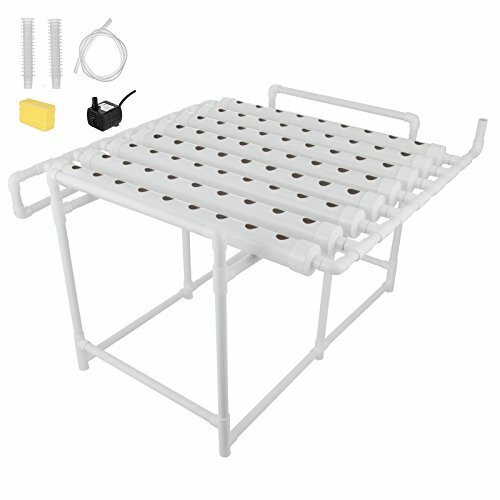 A hydroponics kit is highly recommended for people who have never tried hydroponics before but would like to familiarize themselves with it. Are there any downsides to using such a system? Yes – kits are limited by their specifications, and can only accommodate what they were designed to accommodate. So if you want to raise more plants, for instance, and the number of plants exceeds the specified grow cups in the hydroponics kit, you won’t be able to add plants to your existing system. It’s possible to extend it, but that would require a little know-how in engineering a hydroponics system. Here are a few things to keep an eye out for when deciding which hydroponic kit to buy. The price of hydroponics kits vary depending on the capacity of the nutrient reservoir, the wattage of the pump, the number of grow cups, etc. Essentially, the bigger and heavier the equipment and components in the hydroponics kits, the more you’re going to pay. Before buying a kit, ask yourself – what am I going to use this for? What do I want to cultivate with my hydroponics system? What types of plants do I want to grow and how many of them? Research the behavior and growth patterns of plants that you want to grow first before purchasing a hydroponics system. It would also do you some good if you familiarized yourself with the different types of growth media available in the market. Hydroponics kits often come with rockwool cubes and organic composite materials, but there are other options out there like coconut coir and perlite. Knowing your options will help you select a better system because you will be able to check the specifications of the system versus your actual project needs. To simplify the process of selecting your very own hydroponics kit, we’ve come up with a list of the best hydroponics system kits on the market this year. If you want to get ahead in establishing your very own hydroponic system, but don’t want to spend too much effort on creating your own system (since this is your first time), then your second best option would be to invest in a hydroponics system kit. Featured above in this article, you’ll find our recommendations for our picks for the best hydroponics kit for many different types of users. Each one of those links will take you over to Amazon where you can buy your kit!